A big thank you to Ruataniwha Rowing and their many officials and volunteers who have hosted a massive and superb 2014 Aon Maadi Cup regatta! Videos for Maadi Cup are in the process of being edited. As they are edited they are being uploaded to the RowingNZ YouTube channel. Once that process is complete work will start on the DVD and downloadable video files. Live results are available on the rowIT website: www.rowit.co.nz/results/mads2014. UPDATE: the winners shirts have become available! They are being handed out to medalists now. Those crews who collected medals yesterday or this morning before the shirts were available can collect their shirts from the front of the control tower. We give our sincerest apologies as 2014 Aon Maadi Cup winners shirts have got stuck in customs and aren't being released for us, and have not made their way down to Twizel. Winners shirts will either be delivered to the school or posted/couriered. We hope each school can instead present these at their school assemblies. 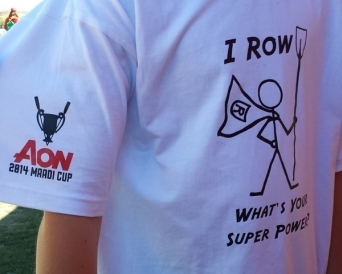 Winners shirts are given to all the gold medal winning crews at the Aon Maadi Cup. We apologise we this inconvenience, unfortunately it is out of hands. On Monday one ligtweight crew failed to make weight and was disqualified: Rosehill 1 in event 18. On Tuesday a second lightweight crew failed to make weight and was disqualified: Rosehill 1 in event 33. Random checks of coxswains are being carried out after racing to make sure they are still over the minimum weight. There have been no problems so far (and Officials look forward to that remaining the case throughout the week!) but coxswains need to remain vigilant about ensuring their weight is above the minimum. With long days of racing and fine weather it is easy for coxswains to lose some weight over the course of the day and they need to make sure that weightloss doesn't drop them below the allowed minimum. 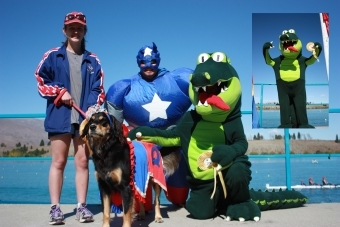 There are three different competitions being run at the 2014 Aon Maadi Cup this year, including a Mascot, banner and t-shirt competition. For the school with the best banner displayed during the Aon Maadi Cup parade. Won by Villa Maria College. For the school with the best banner mascot supporting their school at the lake. Won by Craighead Diocesan School. Second place: St Thomas of Canterbury. Third place: Queens High School. For the school with team t-shirt. Won by Waitaki Boys High School. Prizes that are up for grabs for these competitions were made available by Aon. Thanks Aon! Officials urge schools to check the compliance of heel restraints in all their boats. Heel restraints will be randomly checked BEFORE crews take to the water (and will be sent back to the boat park to fix this accordingly) and AFTER the race; any boat that is non-compliant after a race will face DISQUALIFICATION. Some crews at South Island Secondary Schools were disqualified and did lose medals because of undone ties so please check your boats carefully and be warned that this can affect your race results. Should you have a genuine breakage of these restraints during the race, then the rower should notify the umpire at the end of the race, before they are checked on shore. Reminder that substitutions need to be made through the official channels (online or at the regatta secretary) within the correct timeframe to avoid any penalty to your crews. And remember that you can only substitute 50% of the crew, and you cannot substitute a single. Coxswains - the minimum weight is 55kg for U18 heavyweight events (including novice but not lightweight) for all other events it is 50kg. They need to weigh in not less than one hour and not more than two hours before their events and be in racing costume and with a life jacket. Coxswains only need to weigh in once per day but can be check weighed at any time, and under NZSSRA rules it is the cox PLUS deadweight which is check weighed. Lightweights - Must be weighed before EACH event (not just once per day to cover two events), not less than one hour and not more than two hours before. All members of the crew and a school representative need to be present and rowers need to be in racing costume. Twizel residents are hosting a parade for the 2014 Aon Maadi Cup Competitors on Sunday 23rd 2pm and will finish at the Rec Ground. There will be prizes for the best school banner. There is no wi-fi available at Ruataniwha but there is an Internet kiosk for the public to use in the row shoppe. It costs $2 for 20min. All tents must have a serviceable Fire Extinguisher which must be clearly visible and easily accessible; please make sure your school has one of these readily available. Will be open from Saturday 22nd MArch should you require information about the site or regatta. Car Park charges of $5 per day will apply on Thurs 27th/Fri 28th/Sat 29th for teams will be free and issued one per ten competitors. The windscreen stickers for teams can be picked up from the secretary's office. A reminder that after complaints were received and the concerns of the School Committee around young people and alcohol, NZSSRA and Rowing NZ do not endorse any form of "party" at the Aon Maadi Cup. Should another organisation or school be holding a party then this function is their full responsibility and under the trademark established around the Maadi Cup any event is prevented from being referred to as a "Maadi Party". Junior trialists will be announced on the Rowing NZ website on Sunday 30th March at 9am. If you have not already arranged a tent site on the embankment for your school at the regatta you need to contact Ruataniwha Rowing: Karl Morgan ([email protected]) or Trevor Wilson ([email protected]) will be able to help you with your enquiry. Victoria University provides an excellent weather forecast service. There will be a live webcast of the three last days of the regatta (Thursday, Friday and Saturday). This covers semi-finals, and A-D finals. The webcast is available here: http://www.r2.co.nz/maadi2014. Please be aware Measles cases are on the increase. Measles is highly infectious and starts with a fever, cough, runny nose and/or sore eyes followed a few days later by a rash. People are infectious from 5 days before to 5 days after the rash appears. If you or a student develop symptoms of measles please call Healthline on 0800 611 116 for advice as soon as possible. 4 crews per school per event; except U16 2X events, which have a limit of 1 crew per school. Limits are raised while supplementary entries are open. Revised criteria took effect last year. An updated article about the NZSSSC School Team Eligibility Criteria is available from NZSSRA. Novice eights have been approved as exhibition events and appear in the programme as events 9A (girls) and 17A (boys). Exhibition events are in addition to, not part of, the Championships Programme (see Regulation 6.4.D) so are not eligible for Championships medals or points. 2036 pupils (excluding reserves) from 124 schools entered in 4952 seats in 1451 crews. 565 races were required to complete the regatta and find the winners of all 48 events. New Zealand Defence Force Thursday. The University of Waikato Wednesday. The University of Auckland Tuesday. The 2014 Aon Maadi Cup regatta gets underway with Mainfreight Monday. Monday featured racing from 8:00am until 5:52pm. 110 races at four-minute intervals. Heats for events 1-30. Kolorcare are taking the podium photos and on-water photos. Rowing Images are taking on-water photos.